Both beets and Swiss chard are different varieties within the same plant family (Amaranthaceae-Chenopodiaceae) and their edible leaves share a resemblance in both taste and texture. However, unlike chard, attached to the beet’s green leaves is a sweet, round or oblong root. The wild beet, the ancestor of the beet with which we are familiar today, is thought to have originated in prehistoric times in North Africa and eventually spread wild along Asian and European seashores. In these earlier times, people exclusively ate the beet greens and not the roots. The ancient Romans were one of the first civilizations to cultivate beets to use their roots as food. The tribes that invaded Rome were responsible for spreading beets throughout northern Europe where they were first used for animal fodder and later for human consumption later in the 16th century. Beets’ value grew in the 19th century when it was discovered that they were a concentrated source of sugar, and the first sugar beet factory was built in Poland. When access to sugar cane was restricted by the British, Napoleon decreed that the beet be used as the primary source of sugar, catalyzing its popularity. 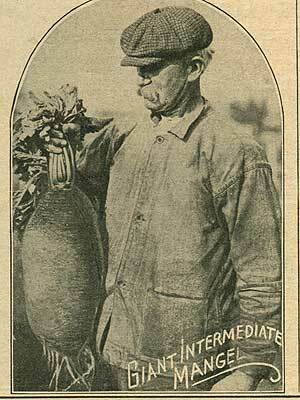 Around this time, beets were also first brought to the United States, where they now flourish. Globally, the leading commercial producers of beets include the United States, the Russian Federation, France, Poland, France and Germany. Today, farmers across the country are fighting the introduction of genetically modified sugar beets into their local agricultural ecosystems. They are deeply concerned that pollen drift from the GM sugar beets will contaminate non-GMO and organic varieties of table beets, as well as chard and related weeds. And because GM sugar beets have been engineered to resist glyphosate (Round-Up) herbicide, farmers, ecologists and public health officials are concerned about the widespread environmental contamination that comes from heavily dousing crops with this toxic and carcinogenic chemical. Help support them by avoiding sugar and sugary products made from GMO sugar beets. Just be aware that GMO beet sugar makes up about 60% of all the sugar produced in the U.S., so if it’s not organic, and it contains sugar, it almost certainly contains GMO-derived sugar. There are five main types of beets, with many varieties within each type. Red table beets produce edible greens in about 30 days, followed by round or cylindrical roots about a month later. Leaves from most red beets have red stems and leaf veins similar to red-leafed chard varieties. The strong magenta color of table beet juice can be used as a natural food dye for coloring eggs, cake frosting and more. White, orange and golden table beets are prized for their mellow, nutty flavor. Because they don’t bleed red juice, these are best for roasting or mixing with other vegetables. Storage beets are table varieties that are grown for fall harvest followed by winter storage in your refrigerator or root cellar. Mangel beets are often called forage beets or fodder beets, and grow huge roots weighing 5 to 20 pounds each. These beets are not flavorful like table beets, and on homesteads and small farms, are typically used as livestock fodder in winter. Sugar beets are bland, mangel-type beets that, today, are grown industrially from GMO seeds to be processed into table sugar. GMO sugar beet seeds are not available to the home gardener, but there are heirloom varieties available in select catalogs (Seed Savers Exchange, Baker Creek Seeds, etc.) 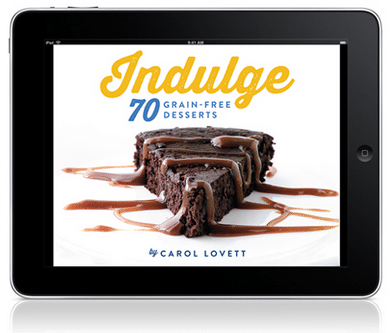 if you want to try sugar beets out at home. 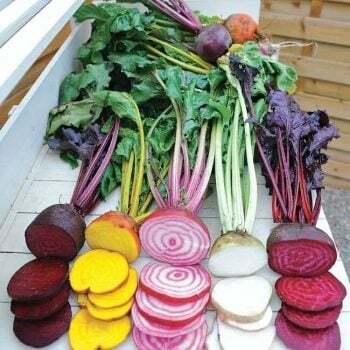 There are tons of beautiful, heirloom varieties of table beets that have a panoply of flavors, colors and shapes you just can’t get from a grocery store, so have fun selecting your beet seeds from the catalogs. The sweetest table beet you can grow is arguably the all-white ‘Albina Vereduna’. This close relative of the sugar beet contains 11% sugar—about twice that of red beets. But there are many sweet red beet varieties that are also outstanding to grow. ‘Detroit Dark Red’ is an old-time heirloom beet variety with rich, dark-red, 3-inch roots. ‘Bull’s Blood’ is very sweet and has pretty rings inside, and reddish-purple leaves that are colorful in salads. Also try ‘Golden’, which has bright yellow flesh and a sweet potato-like flavor, or the heirloom ‘Chioggia’, featuring red-and-white-ringed flesh that looks like a bulls-eye. If you love beet greens, plant ‘Tall Top Early Wonder’, with maroon-tinged leaves and purplish red, round roots. Beet greens can be eaten like spinach or Swiss chard, tossed in salads or used in quick stir fries. 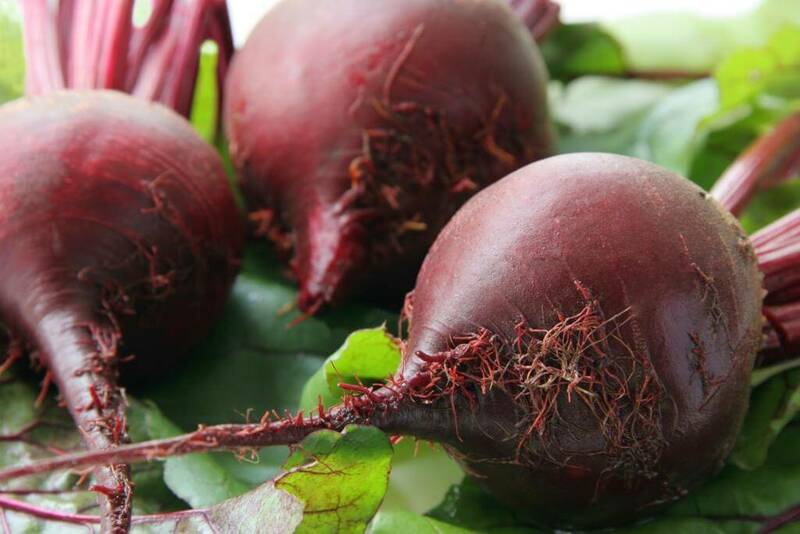 Beets are a cool weather crop, and are best sown 3 to 4 weeks before your last spring frost. Sow seeds again in late summer for a fall crop. In frost free areas, you can do a third planting in September for a February harvest. If you prefer a smaller, continuous harvest throughout the season, sow some beet seeds every three weeks, instead of all at once. In warm areas like Southern California, you can sow beets almost year round, though the warmer it is at harvest time, the less sweet the beets will be. Direct seeding in the garden is the easiest way to grow beets. They can be grown in most types of soil—including containers—but prefer that it be deep, moist, well-drained, and contain plenty of compost or aged manure. Beets need plenty of sun, but they can tolerate partial shade if the climate is warm. To aid germination, soak your beet seeds in pure water for 24 hours before planting. Sow seeds 1/2 inch deep and 2 inches apart. When the beets are 2 to 3 inches tall, usually five or six weeks after planting, thin to one plant every 6 inches. Use a pair of scissors to cut the seedlings off at the soil line. Avoid yanking any seedlings up, because that will disturb the roots of the plants that are left to grow. For beet greens only, sow seeds 1/2 inch apart in all directions. No thinning is necessary. You will probably want 5-10 beets per person in your household, across the season. If you just love beets, or you plan to ferment or can your beets for longterm storage and enjoyment (see pickled beet recipe below), you will probably want to plant more. Beets do best if they have a consistent level of moisture while they are growing, so drip irrigation is a good idea. Beets are seldom bothered by pests or disease, but prevention is always the best measure. Choose varieties of beet seeds that are resistant to the pests and diseases in your region, and plant beets in a different spot each year to minimize the risk of contracting or spreading infections. Also use drip irrigation and organic mulch to minimize the spread of disease via water droplets. If your beet plants have been eaten down to the soil, cutworms are usually the culprits. Sprinkle wood ash around the base of the plants to prevent them. Flea beetles make tiny holes in beet leaves, but healthy plants will quickly outgrow the damage. Flea beetles also love mustard greens and arugula, so diversity among your spring greens can limit damage. Leaf miners make meandering lines in beet leaves. Pesticides cannot control leaf miners, so clip off affected leaves and bury them in an active compost pile to prevent a second generation. Aphids and thrips can deform beet leaves, so spray them with a non-toxic, insecticidal soap. Silvery webs on the undersides of leaves may be the work of spider mites, which can also be sprayed with insecticidal soap. Rabbits eagerly eat beet greens, and voles may attack beets from below just as they form big roots. You can exclude these and other animal pests with appropriate fencing. Beet leaves also can get Cercospora leaf spot, a mild fungal disease made worse by poor plant nutrition and warm, humid weather. Affected leaves develop small spots and cracked, tan edges. You usually can prevent this disease with good crop rotation practices, adequate thinning and a high level of soil fertility. Once it has occurred though, remove infected leaves at once to prevent further spread. Beets take about 45 to 65 days to mature, unless you are harvesting them early for baby salad greens. Pick the greens anytime, but harvest the roots when they are between 1 and 3 inches wide, for greatest sweetness. Roots should be firm, smooth-skinned and deep in color. Smaller, younger beets may be so tender that peeling won’t be needed after they are cooked. Compost any beets that have spots, bruises or soft, wet areas, all of which indicate spoilage. Store the unwashed greens in a separate plastic bag where they will keep fresh for about four days. Beet roots can be boiled, steamed, roasted or used raw. Roasting concentrates beet sugars, making them extra delicious. Use a vegetable peeler to remove skins from beets before roasting them with other vegetables. If preparing them alone, cooking beets in their skins makes the peels slip off easily once they have cooled. To preserve beets, you can slice and dehydrate them into chips, freeze them, can them, or ferment them. Fermenting beets is a great way to enhance their nutrition and provide gut-healthy probiotics. I would consult with the Cooperative Extension Agent for your area. 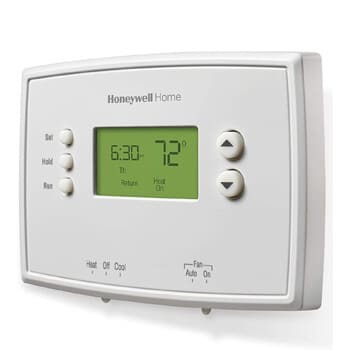 They have all the information for planting in your local climate.